First-year architecture students getting four hours sleep a night perfecting their drawings. Newly-arrived school of art students that are tasked with re-learning everything they thought they knew. Engineering freshmen feeling tackled by an onslaught of math. These are some of the consistent stories one hears about the experiences of incoming students at The Cooper Union's three schools, all of which are known as being among the most rigorous and demanding undergraduate educations in the nation. But what is it really like to show up here and start your higher education? What is your first introduction to each school? What are you asked to do in the first week? What do you learn? Is it crushing? Supportive? Stern? Overwhelming? To answer those questions, we decided to follow three arriving students, one from each school, through their first full week of classes. You will find links to each profile below. First, a brief introduction to the three students. Ezekiel Binns, of The Irwin S. Chanin School of Architecture, Vyczie Dorado of the School of Art and Jenna Scott of the Albert Nerken School of Engineering all kindly agreed to let us follow them around. Ezekiel, 18, grew up in Miami and is a graduate of DASH, an arts- and design-focused high school that seems to be the source of at least one architecture student per year. As such he is already comfortable with terms like "agency" and "blind contour drawing." Jenna, 17, from Eastern Maryland, considered pursuing architecture but decided her drawing skills would never get her into any school, and anyway, math was the only subject that "made any sense" to her. So, she is here studying civil engineering. Vyczie (pronounced VIHK-see), 18, lately from a town near Orlando, attended an arts-focused high school and is a ball of fire burning with enthusiasm and energy, fueled by ramen noodles. In her first seven days of school besides going to classes she has already visited over ten galleries, the Whitney Museum, and RuPaul's DragCon at the Javits Center, mostly by walking everywhere. The subway makes her "nervous," she says. One can follow a single incoming student from each school and get a sense of what every similarly entering student goes through because, as it happens, all three schools have their own standard curriculum for all their first-year students. No electives are allowed. Even in the school of engineering, with its multiple pre-declared majors, every freshman in every discipline takes the same set of courses. Additionally, all three schools require incoming students to take the same series of courses taught through the Faculty of Humanities and Social Sciences (HSS), starting with Freshman Seminar. Lastly, many students, including these three, live in the dorm their first year, establishing a commonality in both living and working. Since classes began on Tuesday, September 5 we accompanied students through the following Monday, September 11. With very few exceptions we attended every class. As we did so, some themes that ran across each of the programs and the overall student experience began to emerge. Courses start, for the most part, with no expectation of earlier knowledge. The School of Art in particular begins students at the basic levels of teaching color theory, design, drawing, and three-dimensional art. This can be frustrating for the likes of Vyczie, who felt ready to hit the fast lane, but is instead forced to apply the brakes and relearn skills she thought she knew already. It seems safe to assume those frustrations will be short lived and were non-existent for Jenna and mixed for Ezekiel. Week One course loads seemed within reason. None of the students reported feeling overwhelmed after the first week, though they all had homework due both within that first week and the following week. If anything, the lessons being taught, the schedule being set, and the expectations being asked seemed far more intimidating and exhausting to the communications staff than to the students. How do they do it? They just do. Of the commonalities between the experiences of the three students perhaps the most striking was an unexpected and unintentionally unified pedagogy of the importance of the connection between hand gesture and mind. This began almost immediately for Ezekiel when Professor Maren Stange, teaching the Freshman Seminar class (and, owing to curiosities of scheduling at The Cooper Union, the first class for every incoming student), began her instruction by stating the requirement to take hand-written notes. "It has been scientifically shown," she said, "that writing by hand significantly reinforces learning." A day later, Sue Gussow, professor emeritus, who has taught drawing to generations of Cooper architecture students, and currently co-instructing the first-year Freehand Drawing studio, introduced her students to her well-known mantra, "Drawing is thinking." She tells them she wishes she could rename the class, "It's in Your Hands." Meanwhile, across the street, Jenna sits in her Engineering Graphics class where Professor Brian Cusack ME’01/MME’03 announces, perhaps to some surprise, that much of the drafting will be done by hand using tools like T-squares and triangles. This is because, he says, the act of drawing different shapes by hand reinforces the understanding of those shapes, as opposed to using digital tools where the gesture is the same for everything. Back at the School of Art, Vyczie gets corrections to her physical position during her drawing class to better achieve a cleaner, more meaningful line. 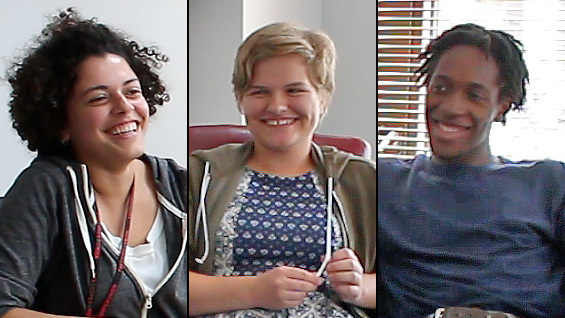 The exact details of Jenna, Vyczie, and Ezekiel's first week of courses will be examined in a series of three articles, one for each school, in the coming weeks. Among the surprises will be a school-wide twist to the usual beginning week in the school of architecture as well as a shocking update to a fundamental math rule that left some engineering students flabbergasted (“It’s like they lied to us in high school!”) At the end of the series you will also get to see and hear Jenna, Vyczie, and Ezekiel discuss their experiences as part of our Cooper to Cooper series of videos that explore "conversations between disciplines." They talk about school, but don’t shy away from other, more immediate topics: transitioning to the scale of New York City; loneliness; food and the vicissitudes and pleasures of cooking in a dorm; and creative ways to save money (spoiler alert: trash plays a significant role).